As a parent you may be concerned that your preschooler has a vision problem and wonder when they should have their first eye exam. 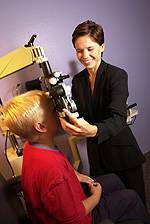 It is extremely important for children to have eye exams. Experts say that an estimated 5 to 10% of preschoolers and 25% of school-aged children have vision issues. It is crucial to identify any vision problem early because if left untreated, some childhood vision problems can cause permanent loss of vision. Find out how vision changes as you age.